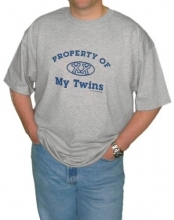 Property of My Twins Mens T-Shirt Discounts Apply ! As anyone with twins can tell you, it takes serious commitment to be a "twin dad". This is our twins version of the popular "property of..." athletic t-shirts. We love the little 'x' figures. Available in white or gray.